It is 2020 and the Moon has been colonised. Spaceships Vega, Sirius and Capella are launched to space in order to explore Venus. The mission is being run from moon base Lunar 7 by the man who has planned it from its opening stages, professor Hartman. Spaceship Capella get strucked by an asteroid and professor Hartman wants to postpone the landing but the crew on the spaceship Vega has other plans. Two astronauts, accompanied by their robot, set out to explore the surface of the planet. Things seem to be going well until violent changes begin to rework the surface. Will they be able to escape the planet with their lives? 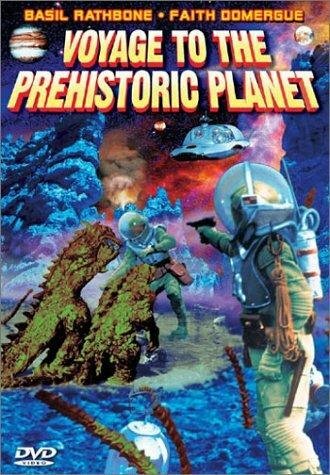 Voyage to the Prehistoric Planet was slapped together from footage from a Russian science fiction movie and additional footage with American actors. Although none of the additional footage is interesting or helps the plodding story along very much, original parts from the Russian movie and effects are good. This film was made in 60’s when American International Pictures really started living up to their name. In addition to shooting an increasing percentage of their own films overseas, American International Pictures began importing huge quantities of foreign product. In order to see this movie you must have the power of will to shut down all of yours rational thoughts for an hour and a little bit more. The film is actually a US adapted and edited version of the Russian sci-fi movie Planeta Bur directed by Pavel Klushantsev with some American actors for the US/English speaking market. If you see a big plant don’t get too close… It can eat you! Special effects in the film are suprizingly good. Not that they can match present special effects but ,for the 60’s, they are very well done. This is not your typical B flick. Written by the great Larry Buchanan, it was cornier the most yet I have to admit I loved it. This was totally worth my time. We start with a rocket scientist, who makes a home made “high power” radio set. With this radio he starts to get messages from Zontar. Zontar is from Venus and thinks Earth people need to see/learn what it’s like to be without “modern” forms of communication. He wants to “be in command of everyone”. People can’t even take a bath without the okay from this Venus weirdo! The rest of the movie I was a little lost. It was hard to follow as nothing really made any sense, however that did not detract from the entertainment factor. I mean the film had these bat looking animals biting people and putting a micro chip in them that made them virtual slaves to Zontar. I guess it could have been worse (you should see Terminal USA) 🙂 True dramatic genus.